Take a long, hard look at your home and landscape. If you are completely content with how it looks, fine. But there might be a few things you can do to actually improve not only its look, but increase its value, as well. Upgrade your front and garage door — If you’ve had the same front door or garage door for years, it might be time for an upgrade. So many homeowners spend a lot of money improving the look and feel of their house but end up neglecting their garage and front doors. These are some of the items that people will notice immediately, though, so you should make sure they look terrific. Residential fence installation — Installing a nice fence on your property can look fantastic, give you plenty of privacy from your neighbors, and even boost your entire property value. Keep in mind, however, that different jurisdictions may require residential fences to be set two, four, six, or even eight inches away from the property line. Replace your roof — If you’ve been in the same home for more than a decade, though your roof is probably still intact, it might not look as nice as it used to. Replacing or improving your roof might cost a pretty penny at first, but it will certainly be worth it in the long run as it will surely increase your home’s resale value. Place water features — Creating a backyard oasis, complete with the relaxing sound of running water, can turn your landscape into the peaceful environment you’ve always dreamed of. 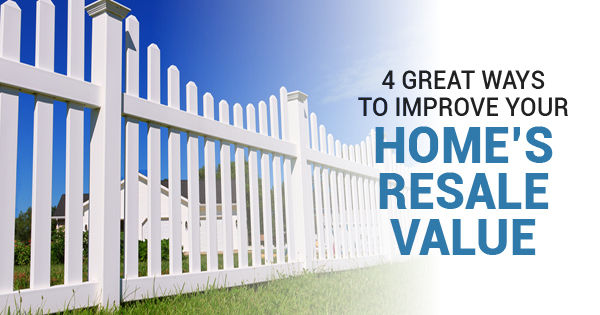 Plus, these water features can significantly boost your property’s value. So add a pond, a small waterfall, or any kind of water feature you want and enjoy! You should never neglect your home — even if you love the way it looks, it can always be improved and be worth much more. If you want to learn more about how a residential fence can improve your home’s value or have one installed, contact Durham Fence and Guardrail today!